The Mishnah or Mishna (/ˈmɪʃnə/; Hebrew: מִשְׁנָה, "study by repetition", from the verb shanah שנה, or "to study and review", also "secondary") is the first major written collection of the Jewish oral traditions known as the "Oral Torah". It is also the first major work of Rabbinic literature. The Mishnah was redacted by Judah the Prince at the beginning of the third century CE in a time when, according to the Talmud, the persecution of the Jews and the passage of time raised the possibility that the details of the oral traditions of the Pharisees from the Second Temple period (536 BCE – 70 CE) would be forgotten. Most of the Mishnah is written in Mishnaic Hebrew, while some parts are Aramaic. The Mishnah consists of six orders (sedarim, singular seder סדר), each containing 7–12 tractates (masechtot, singular masechet מסכת; lit. "web"), 63 in total, and further subdivided into chapters and paragraphs. The word Mishnah can also indicate a single paragraph of the work, i.e. the smallest unit of structure in the Mishnah. For this reason the whole work is sometimes called in the plural, Mishnayot. The term "Mishnah" originally referred to a method of teaching by presenting topics in a systematic order, as contrasted with Midrash, which followed the order of the Bible. As a written compilation, the order of the Mishnah is by subject matter and includes a much broader selection of halakhic subjects, and discusses individual subjects more thoroughly, than the Midrash. The Mishnah consists of six orders (sedarim, singular seder סדר), each containing 7–12 tractates (masechtot, singular masechet מסכת; lit. "web"), 63 in total. Each masechet is divided into chapters (peraqim, singular pereq) and then paragraphs (mishnayot, singular mishnah). In this last context, the word mishnah means a single paragraph of the work, i.e. the smallest unit of structure, leading to the use of the plural, "Mishnayot", for the whole work. Because of the division into six orders, the Mishnah is sometimes called 'Shas' (an acronym for Shisha Sedarim – the "six orders"), though that term is more often used for the Talmud as a whole. Tohorot ("Purities"), pertaining to the laws of purity and impurity, including the impurity of the dead, the laws of food purity and bodily purity (12 tractates). In each order (with the exception of Zeraim), tractates are arranged from biggest (in number of chapters) to smallest. A popular mnemonic consists of the acronym "Z'MaN NaKaT." Reuvein Margolies (1889–1971) posited that there were originally seven orders of Mishnah, citing a Gaonic tradition on the existence of a seventh order containing the laws of Sta"m (scribal practice) and Berachot (blessings). A number of important laws are not elaborated upon in the Mishnah. These include the laws of tzitzit, tefillin (phylacteries), mezuzot, the holiday of Hanukkah, and the laws of conversion to Judaism. These were later discussed in the minor tractates. Nissim ben Jacob's Hakdamah Le'mafteach Hatalmud argued that it was unnecessary for Judah the Prince to discuss them as many of these laws were so well known. Margolies suggests that as the Mishnah was redacted after the Bar Kokhba revolt, Judah could not have included discussion of Hanukkah, which commemorates the Jewish revolt against the Seleucid Empire (the Romans would not have tolerated this overt nationalism). Similarly, there were then several decrees in place aimed at suppressing outward signs of national identity, including decrees against wearing tefillin and tzitzit; as conversion to Judaism was against Roman law, Judah would not have discussed this. David Zvi Hoffmann suggests that there existed ancient texts analogous to the present-day Shulchan Aruch that discussed the basic laws of day to day living and it was therefore not necessary to focus on these laws in the Mishnah. Rabbinic commentaries on the Mishnah from the next four centuries, done in the Land of Israel and in Babylonia, were eventually redacted and compiled as well. In themselves they are known as Gemara. The books which set out the Mishnah in its original structure, together with the associated Gemara, are known as Talmuds. Two Talmuds were compiled, the Babylonian Talmud (to which the term "Talmud" normally refers) and the Jerusalem Talmud. Unlike the Hebrew Mishnah, the Gemara is written primarily in Aramaic. The Mishnah teaches the oral traditions by example, presenting actual cases being brought to judgment, usually along with the debate on the matter and the judgment that was given by a notable rabbi based on halakha, mitzvot, and spirit of the teaching ("Torah") that guided his decision. In this way, it brings to everyday reality the practice of the mitzvot as presented in the Torah, and aims to cover all aspects of human living, serve as an example for future judgments, and, most important, demonstrate pragmatic exercise of the Biblical laws, which was much needed since the time when the Second Temple was destroyed (70 CE). The Mishnah is not the development of new laws, but rather the collection of existing traditions. The term "Mishnah" is related to the verb "shanah", to teach or repeat, and to the adjectives "sheni" and "mishneh", meaning "second". It is thus named for being both the one written authority (codex) secondary (only) to the Tanakh as a basis for the passing of judgment, a source and a tool for creating laws, and the first of many books to complement the Tanakh in certain aspects. 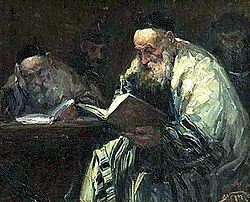 Before the publication of the Mishnah, Jewish scholarship and judgement were predominantly oral, as according to the Talmud, it was not permitted to write them down. The earliest recorded oral law may have been of the midrashic form, in which halakhic discussion is structured as exegetical commentary on the Torah. Rabbis expounded on and debated the Tanakh, the Hebrew Bible, without the benefit of written works (other than the Biblical books themselves), though some may have made private notes (מגילות סתרים) for example of court decisions. The oral traditions were far from monolithic, and varied among various schools, the most famous of which were the House of Shammai and the House of Hillel. After First Jewish–Roman War in 70 CE, with the end of the Second Temple Jewish center in Jerusalem, Jewish social and legal norms were in upheaval. The Rabbis were faced with the new reality of Judaism without a Temple (to serve as the center of teaching and study) and Judea without autonomy. It is during this period that Rabbinic discourse began to be recorded in writing. The possibility was felt that the details of the oral traditions of the Pharisees from the Second Temple period (530s BCE – 70 CE) would be forgotten, so the justification was found to have these oral laws transcribed. Over time, different traditions of the Oral Law came into being, raising problems of interpretation. According to the Mevo Hatalmud, many rulings were given in a specific context, but would be taken out of it; or a ruling was revisited but the second ruling would not become popularly known. To correct this, Judah the Prince took up the redaction of the Mishnah. If a point was of no conflict, he kept its language; where there was conflict, he reordered the opinions and ruled; and he clarified where context was not given. The idea was not to use his own discretion, but rather to examine the tradition as far back as he could, and only supplement as required. According to Rabbinic Judaism, the Oral Torah (Hebrew: תורה שבעל-פה‎) was given to Moses with the Torah at Mount Sinai or Mount Horeb as an exposition to the latter. The accumulated traditions of the Oral Law, expounded by scholars in each generation from Moses onward, is considered as the necessary basis for the interpretation, and often for the reading, of the Written Law. Jews sometimes refer to this as the Masorah (Hebrew: מסורה), roughly translated as tradition, though that word is often used in a narrower sense to mean traditions concerning the editing and reading of the Biblical text (see Masoretic Text). The resulting Jewish law and custom is called halakha. While most discussions in the Mishnah concern the correct way to carry out laws recorded in the Torah, it usually presents its conclusions without explicitly linking them to any scriptural passage, though scriptural quotations do occur. For this reason it is arranged in order of topics rather than in the form of a Biblical commentary. (In a very few cases, there is no scriptural source at all and the law is described as Halakha leMoshe miSinai, "law to Moses from Sinai".) The Midrash halakha, by contrast, while presenting similar laws, does so in the form of a Biblical commentary and explicitly links its conclusions to details in the Biblical text. These Midrashim often predate the Mishnah. The Mishnah also quotes the Torah for principles not associated with law, but just as practical advice, even at times for humor or as guidance for understanding historical debates. Some Jews did not accept the codification of the oral law at all. Karaite Judaism, for example, recognised only the Tanakh as authoritative in Halakha (Jewish religious law) and theology. It vehemently rejected the codification of the Oral Torah in the Mishnah and Talmud and subsequent works of mainstream Rabbinic Judaism which maintained that the Talmud was an authoritative interpretations of the Torah. Karaites maintained that all of the divine commandments handed down to Moses by God were recorded in the written Torah without additional Oral Law or explanation. As a result, Karaite Jews did not accept as binding the written collections of the oral tradition in the Midrash or Talmud. The Karaites comprised a significant portion of the world Jewish population in the 10th and 11th centuries CE, and remain extant, although they currently number in the thousands. The rabbis who contributed to the Mishnah are known as the Tannaim, of whom approximately 120 are known. The period during which the Mishnah was assembled spanned about 130 years, or five generations, in the first and second centuries CE. Judah the Prince is credited with the final redaction and publication of the Mishnah, although there have been a few additions since his time: those passages that cite him or his grandson, Judah II, and the end of tractate Sotah, which refers to the period after Judah the Prince's death. One must also note that in addition to redacting the Mishnah, Judah the Prince and his court also ruled on which opinions should be followed, though the rulings do not always appear in the text. Most of the Mishnah is related without attribution (stam). This usually indicates that many sages taught so, or that Judah the Prince ruled so. The halakhic ruling usually follows that view. Sometimes, however, it appears to be the opinion of a single sage, and the view of the sages collectively (Hebrew: חכמים‎, hachamim) is given separately. As Judah the Prince went through the tractates, the Mishnah was set forth, but throughout his life some parts were updated as new information came to light. Because of the proliferation of earlier versions, it was deemed too hard to retract anything already released, and therefore a second version of certain laws were released. The Talmud refers to these differing versions as Mishnah Rishonah ("First Mishnah") and Mishnah Acharonah ("Last Mishnah"). David Zvi Hoffmann suggests that Mishnah Rishonah actually refers to texts from earlier Sages upon which Rabbi based his Mishnah. The Talmud records a tradition that unattributed statements of the law represent the views of Rabbi Meir (Sanhedrin 86a), which supports the theory (recorded by Sherira Gaon in his famous Iggeret) that he was the author of an earlier collection. For this reason, the few passages that actually say "this is the view of Rabbi Meir" represent cases where the author intended to present Rabbi Meir's view as a "minority opinion" not representing the accepted law. There are also references to the "Mishnah of Rabbi Akiva", suggesting a still earlier collection; on the other hand, these references may simply mean his teachings in general. Another possibility is that Rabbi Akiva and Rabbi Meir established the divisions and order of subjects in the Mishnah, making them the authors of a school curriculum rather than of a book. Authorities are divided on whether Rabbi Judah the Prince recorded the Mishnah in writing or established it as an oral text for memorisation. The most important early account of its composition, the Iggeret Rav Sherira Gaon (Epistle of Rabbi Sherira Gaon) is ambiguous on the point, although the Spanish recension leans to the theory that the Mishnah was written. However, the Talmud records that, in every study session, there was a person called the tanna appointed to recite the Mishnah passage under discussion. This may indicate that, even if the Mishnah was reduced to writing, it was not available on general distribution. Very roughly, there are two traditions of Mishnah text. One is found in manuscripts and printed editions of the Mishnah on its own, or as part of the Jerusalem Talmud. The other is found in manuscripts and editions of the Babylonian Talmud; though there is sometimes a difference between the text of a whole paragraph printed at the beginning of a discussion (which may be edited to conform with the text of the Mishnah-only editions) and the line-by-line citations in the course of the discussion. Robert Brody, in his Mishna and Tosefta Studies (Jerusalem 2014), warns against over-simplifying the picture by assuming that the Mishnah-only tradition is always the more authentic, or that it represents a "Palestinian" as against a "Babylonian" tradition. Manuscripts from the Cairo Geniza, or citations in other works, may support either type of reading or other readings altogether. The first printed edition of the Mishnah was published in Naples. There have been many subsequent editions, including the late 19th century Vilna edition, which is the basis of the editions now used by the religious public. Vocalized editions were published in Italy, culminating in the edition of David ben Solomon Altaras, publ. Venice 1737. The Altaras edition was republished in Mantua in 1777, in Pisa in 1797 and 1810 and in Livorno in many editions from 1823 until 1936: reprints of the vocalized Livorno editions were published in Israel in 1913, 1962, 1968 and 1976. These editions show some textual variants by bracketing doubtful words and passages, though they do not attempt detailed textual criticism. The Livorno editions are the basis of the Sephardic tradition for recitation. As well as being printed on its own, the Mishnah is included in all editions of the Babylonian and Jerusalem Talmuds. Each paragraph is printed on its own, and followed by the relevant Gemara discussion. However, that discussion itself often cites the Mishnah line by line. While the text printed in paragraph form has generally been standardized to follow the Vilna edition, the text cited line by line in the Gemara often preserves important variants, which sometimes reflect the readings of older manuscripts. The nearest approach to a critical edition is that of Hanoch Albeck. There is also an edition by Yosef Qafiḥ of the Mishnah together with the commentary of Maimonides, which compares the base text used by Maimonides with the Napoli and Vilna editions and other sources. A traditional setting of the last passage of the first tractate, Berakhot, which describes how scholars of the Talmud create peace in the world. Performed by Cantor Meyer Kanewsky in 1919 for Edison Records. The Mishnah was and still is traditionally studied through recitation (out loud). Jewish communities around the world preserved local melodies for chanting the Mishnah, and distinctive ways of pronouncing its words. Many medieval manuscripts of the Mishnah are vowelized, and some of these, especially some fragments found in the Genizah, are partially annotated with Tiberian cantillation marks. Today, many communities have a special tune for the Mishnaic passage "Bammeh madliqin" in the Friday night service; there may also be tunes for Mishnaic passages in other parts of the liturgy, such as the passages in the daily prayers relating to sacrifices and incense and the paragraphs recited at the end of the Musaf service on Shabbat. Otherwise, there is often a customary intonation used in the study of Mishnah or Talmud, somewhat similar to an Arabic mawwal, but this is not reduced to a precise system like that for the Biblical books. (In some traditions this intonation is the same as or similar to that used for the Passover Haggadah.) Recordings have been made for Israeli national archives, and Frank Alvarez-Pereyre has published a book-length study of the Syrian tradition of Mishnah reading on the basis of these recordings. Most vowelized editions of the Mishnah today reflect standard Ashkenazic vowelization, and often contain mistakes. The Albeck edition of the Mishnah was vowelized by Hanokh Yalon, who made careful eclectic use of both medieval manuscripts and current oral traditions of pronunciation from Jewish communities all over the world. The Albeck edition includes an introduction by Yalon detailing his eclectic method. Two institutes at the Hebrew University in Jerusalem have collected major oral archives which hold (among other things) extensive recordings of Jews chanting the Mishnah using a variety of melodies and many different kinds of pronunciation. These institutes are the Jewish Oral Traditions Research Center and the National Voice Archives (the Phonoteca at the Jewish National and University Library). See below for external links. The two main commentaries on the Mishnah are the Babylonian Talmud and the Jerusalem Talmud. Neither work covers the whole Mishnah, but each work is on about 50–70% of the text. The reason that the Talmud is not usually viewed as a commentary on the Mishnah, is because it also has many other goals, and can get involved in long tangential discussions. However, the main purpose of the Talmud is as a commentary on the Mishnah. In 1168, Maimonides (Rambam) published Kitab as-Siraj (The Book of the Lantern, Arabic: كتاب السراج‎) a comprehensive commentary on the Mishnah. It was written in Arabic using Hebrew letters (what is termed Judeo-Arabic) and was one of the first commentaries of its kind. In it, Rambam condensed the associated Talmudical debates, and offered his conclusions in a number of undecided issues. Of particular significance are the various introductory sections – as well as the introduction to the work itself – these are widely quoted in other works on the Mishnah, and on the Oral law in general. Perhaps the most famous is his introduction to the tenth chapter of tractate Sanhedrin where he enumerates the thirteen fundamental beliefs of Judaism. Rabbi Samson of Sens (France) was, apart from Maimonides, one of the few rabbis of the early medieval era to compose a Mishnah commentary on some tractates. It is printed in many editions of the Mishnah. It is interwoven with his commentary on major parts of the Tosefta. Rabbi Obadiah ben Abraham of Bertinoro (15th century) wrote one of the most popular Mishnah commentaries. He draws on Maimonides' work but also offers Talmudical material (in effect a summary of the Talmudic discussion) largely following the commentary of Rashi. In addition to its role as a commentary on the Mishnah, this work is often referenced by students of Talmud as a review-text, and is often referred to as "the Bartenura" or "the Ra'V". Yomtov Lipman Heller wrote a commentary called Tosafot Yom Tov. In the introduction Heller says that his aim is to make additions (tosafoth) to Bertinoro’s commentary. The glosses are sometimes quite detailed and analytic. That is why it is sometimes compared to the Tosafot – discussions of Babylonian gemara by French and German scholars of the 12th–13th centuries. In many compact Mishnah printings, a condensed version of his commentary, titled Ikar Tosafot Yom Tov, is featured. An 11th-century CE commentary of the Mishnah, composed by Rabbi Nathan ben Abraham, President of the Academy in Eretz Israel. This relatively unheard-of commentary was first printed in Israel in 1955. A prominent commentary from the 19th century is Tiferet Yisrael by Rabbi Israel Lipschitz. It is subdivided into two parts, one more general and the other more analytical, titled Yachin and Boaz respectively (after two large pillars in the Temple in Jerusalem). Although Rabbi Lipschutz has faced some controversy in certain Hasidic circles, he was greatly respected by such sages as Rabbi Akiva Eiger, whom he frequently cites, and is widely accepted in the Yeshiva world. The Tiferet Yaakov is an important gloss on the Tiferet Yisrael. Symcha Petrushka's commentary was written in Yiddish in 1945 (published in Montreal). Its vocalization is supposed to be of high quality. The commentary by Rabbi Pinhas Kehati, which is written in Modern Israeli Hebrew and based on classical and contemporary works, has become popular in the late 20th century. The commentary is designed to make the Mishnah accessible to a wide readership. Each tractate is introduced with an overview of its contents, including historical and legal background material, and each Mishnah is prefaced by a thematic introduction. The current version of this edition is printed with the Bartenura commentary as well as Kehati's. The encyclopedic editions put out by Mishnat Rav Aharon (Beis Medrosho Govoah, Lakewood) on Peah, Sheviit, Challah, and Yadayim. The above-mentioned edition edited by Hanokh Albeck and vocalized by Hanokh Yellin (1952–59) includes the former's extensive commentary on each Mishnah, as well as introductions to each tractate (Masekhet) and order (Seder). This commentary tends to focus on the meaning of the mishnayot themselves, without as much reliance on the Gemara's interpretation and is, therefore, considered valuable as a tool for the study of Mishnah as an independent work. Rabbi Yehuda Leib Ginsburg wrote a commentary on ethical issues, Musar HaMishnah. The commentary appears for the entire text except for Tohorot and Kodashim. Shmuel Safrai, Chana Safrai and Ze'ev Safrai have half completed a 45 volume socio-historic commentary "Mishnat Eretz Yisrael". Both the Mishnah and Talmud contain little serious biographical studies of the people discussed therein, and the same tractate will conflate the points of view of many different people. Yet, sketchy biographies of the Mishnaic sages can often be constructed with historical detail from Talmudic and Midrashic sources. According to the Encyclopaedia Judaica (Second Edition), it is accepted that Judah the Prince added, deleted, and rewrote his source material during the process of redacting the Mishnah. Modern authors who have provided examples of these changes include J.N. Epstein and S. Friedman. Following Judah the Prince's redaction there remained a number of different versions of the Mishnah in circulation. The Mishnah used in the Babylonian rabbinic community differing markedly from that used in the Palestinian one. Indeed within these rabbinic communities themselves there are indications of different versions being used for study. These differences are shown in divergent citations of individual Mishnah passages in the Talmud Yerushalmi and the Talmud Bavli, and in variances of medieval manuscripts and early editions of the Mishnah. The best known examples of these differences is found in J.N.Epstein’s Introduction to the Text of the Mishnah (1948). Epstein has also concluded that the period of the Amoraim was one of further deliberate changes to the text of the Mishnah, which he views as attempts to return the text to what was regarded as its original form. These lessened over time, as the text of the Mishnah became more and more regarded as authoritative. Many modern historical scholars have focused on the timing and the formation of the Mishnah. A vital question is whether it is composed of sources which date from its editor's lifetime, and to what extent is it composed of earlier, or later sources. Are Mishnaic disputes distinguishable along theological or communal lines, and in what ways do different sections derive from different schools of thought within early Judaism? Can these early sources be identified, and if so, how? In response to these questions, modern scholars have adopted a number of different approaches. Some scholars hold that there has been extensive editorial reshaping of the stories and statements within the Mishnah (and later, in the Talmud.) Lacking outside confirming texts, they hold that we cannot confirm the origin or date of most statements and laws, and that we can say little for certain about their authorship. In this view, the questions above are impossible to answer. See, for example, the works of Louis Jacobs, Baruch M. Bokser, Shaye J. D. Cohen, Steven D. Fraade. Some scholars hold that the Mishnah and Talmud have been extensively shaped by later editorial redaction, but that it contains sources which we can identify and describe with some level of reliability. In this view, sources can be identified to some extent because each era of history and each distinct geographical region has its own unique feature, which one can trace and analyze. Thus, the questions above may be analyzed. See, for example, the works of Goodblatt, Lee Levine, David C. Kraemer and Robert Goldenberg. Some scholars hold that many or most of the statements and events described in the Mishnah and Talmud usually occurred more or less as described, and that they can be used as serious sources of historical study. In this view, historians do their best to tease out later editorial additions (itself a very difficult task) and skeptically view accounts of miracles, leaving behind a reliable historical text. See, for example, the works of Saul Lieberman, David Weiss Halivni, Avraham Goldberg and Dov Zlotnick. A notable literary work on the composition of the Mishnah is Milton Steinberg's novel As a Driven Leaf. ^ The same meaning is suggested by the term Deuterosis ("doubling" or "repetition" in Ancient Greek) used in Roman law and Patristic literature. However it is not always clear from the context whether the reference is to the Mishnah or to the Targum, which could be regarded as a "doubling" of the Torah reading. ^ The list of joyful days known as Megillat Taanit is older, but according to the Talmud it is no longer in force. ^ Maimonides. "Commentary on Tractate Avot with an Introduction (Shemona perakim)". World Digital Library. Retrieved 9 October 2018. ^ "Mishnah". Encyclopaedia Judaica. 14 (2 ed.). p. 319. ISBN 978-0-02-865942-8. . Heinrich Graetz, dissenting, places the Mishnah's compilation in 189 CE (see: H. Graetz, History of the Jews, vol. 6, Philadelphia 1898, p. 105), and which date follows that penned by Rabbi Abraham ben David in his "Sefer HaKabbalah le-Ravad," or what was then anno 500 of the Seleucid era. ^ Eisenberg, Ronald L. (2004). "Rabbinic Literature". The JPS Guide to Jewish Traditions. Philadelphia: The Jewish Publication Society. pp. 499–500. ^ "יסוד המשנה ועריכתה" [Yesod Hamishna Va'arichatah] (in Hebrew). pp. 25–28. Retrieved 9 October 2018. ^ Babylonian Talmud, Temurah 14b; Gittin 60a. ^ Dr. Shayna Sheinfeld. "The Exclusivity of the Oral Law". Retrieved February 2, 2019. ^ Strack, Hermann Leberecht (1945). Introduction to the Talmud and Midrash. Jewish Publication Society. pp. 11–12. Retrieved 9 October 2018. [The Oral Law] was handed down by word of mouth during a long period. ... The first attempts to write down the traditional matter, there is reason to believe, date from the first half of the second post-Christian century. Strack theorizes that the growth of a Christian canon (the New Testament) was a factor that influenced the Rabbis to record the oral law in writing. ^ The theory that the destruction of the Temple and subsequent upheaval led to the committing of Oral Law into writing was first explained in the Epistle of Sherira Gaon and often repeated. See, for example, Grayzel, A History of the Jews, Penguin Books, 1984, p. 193. ^ Though as shown below, there is some disagreement about whether the Mishnah was originally put in writing. ^ Schloss, Chaim (2002). 2000 Years of Jewish History: From the Destruction of the Second Bais Hamikdash Until the Twentieth Century. Philipp Feldheim. p. 68. Retrieved February 1, 2019. Despite the many secular demands on his time, Rabbeinu Shmuel authored a number of books. The most famous is the Mevo HaTalmud, an introduction to the study of the Talmud which clarifies the language and structure which can be so confusing to beginners. In addition, the Mevo HaTalmud describes the development of the Mishnah and the Gemara and lists the Tannaim and Amoraim who were instrumental in preparing the Talmud. ^ Lex Robeberg. "Why The Mishnah Is the Best Jewish Book You've Never Read". myjewishlearning.com. Retrieved February 2, 2019. ^ Outhwaite, Ben. "Mishnah". Cambridge Digital Library. Retrieved 8 October 2018. ^ The plural term (singular tanna) for the Rabbinic sages whose views are recorded in the Mishnah; from the Aramaic root tanna (תנא) equivalent for the Hebrew root shanah (שנה), as in Mishnah. ^ According to the Epistle (Iggeret) of Sherira Gaon. ^ This theory was held by David Zvi Hoffman, and is repeated in the introduction to Herbert Danby's Mishnah translation. ^ Yeivin, Israel (1960). Cantillation of the Oral Law (in Hebrew). Leshonenu 24. pp. 47–231. ^ "הקדמה לפירוש המשנה" [Introduction to the Mishnah Commentary]. Daat.ac.il (in Hebrew). Retrieved 9 October 2018. ^ "הקדמת רמב"ם לפרק "חלק"" [Rambam's introduction to the chapter "Chelek"]. Daat.ac.il (in Hebrew). Retrieved 9 October 2018. ^ Margolis, Rebecca (2009). "Translating Jewish Poland into Canadian Yiddish: Symcha Petrushka's Mishnayes" (PDF). TTR : traduction, terminologie, rédaction. 22 (2): 183–209. Retrieved 9 October 2018. ^ a b c "The Traditional Interpretation of the Mishnah". Encyclopaedia Judaica. 14 (2 ed.). p. 327. ISBN 978-0-02-865942-8. Philip Blackman. Mishnayoth. The Judaica Press, Ltd., reprinted 2000 (ISBN 978-0-910818-00-1). Online PDF at HebrewBooks: Zeraim, Moed, Nashim, Nezikin, Kodashim, Tehorot. Herbert Danby. The Mishnah. Oxford, 1933 (ISBN 0-19-815402-X). Jacob Neusner. The Mishnah: A New Translation. New Haven, reprint 1991 (ISBN 0-300-05022-4). Various editors. The Mishnah, a new translation with commentary Yad Avraham. New York: Mesorah publishers, since the 1980s. [Yoseph Milstein + Various editors.] The Mishnah, a new integrated translation and commentary based on Rabbeinu Ovadiah M'Bartenurah, Machon Yisrael Trust, available online at eMishnah.com. Jacob Neusner Judaism: The Evidence of the Mishnah (Chicago: University of Chicago Press, 1981), pp. 14–22. Wikisource's Open Mishna Project is developing Mishnah texts, commentaries, and translations. The project is currently available in four languages: Hebrew (the largest collection), English, French and Portuguese. Learn Mishna in Someone's Memory – Create a Shloshim Mishnah list online. Mechon Mamre (Hebrew) – Hebrew text of the Mishnah according to Maimonides' version (based on the manuscript of his Mishnah commentary in his own handwriting). The Structured Mishnah – Hebrew text according to the Albeck edition (without vowels) with special formatting. Online Treasury of Talmudic Manuscripts, Jewish National and University Library in Hebrew. Codex Kaufmann of the Mishnah – High resolution images of this important textual witness. eMishnah – English Translation & Commentary. Ahrend, Aaron (2004). "לימוד משנה וחברות משנה בעת החדשה" [Mishna Study and Study Groups in Modern Times] (PDF). Jewish Studies, An Internet Journal (in Hebrew). 3. Mishna Yomit at the Wayback Machine (archived 10 October 2011) – One Mishnah per day. (Note: this study-cycle follows a different schedule than the regular one; contains extensive archives in English). Mishnah Yomit – MishnahYomit.com hosts a weekly publication complementing the learning of people studying the regular program. It include articles, review questions and learning aids. Kehati Mishna at the Wayback Machine (archived June 25, 2003) – A program of two Mishnayot per day. Currently inactive, but archives contain the complete text of Kehati in English for Moed, Nashim, Nezikin, and about half of Kodashim. Daf Yomi Review at the Wayback Machine (archived 29 August 2018) – Custom learning and review programs for Mishnah. Perek HaYomi (Hebrew) – Host to Shiurim, and learning and review according to the Perek HaYomi in Mishna instituted by the Maharal. 2 Mishnas A Day – A program of learning two mishnayos every day. Site include Hebrew and English together with a link for audio for each day. The National Sound Archives at the Hebrew University (catalogue not currently online).